There’s a lot happening at The Hudson Room. Walk into the Peekskill restaurant, on the corner of South Division and Broad streets, just down from the Paramount Hudson Valley Theater, and you’re met with a few different options. Are you looking to unwind with a craft beer at the bar while you take in the game on one of the largest TVs in the area? The restaurant’s got you covered. How about dinner while enjoying a hometown cover band? Done. You’re in the mood for sushi, you say? Don’t worry. The restaurant has that, too. This eclectic yet cohesive mix of styles is the brainchild of Hudson Room owner Louie Lanza, a friendly, fast-talking California native and Garrison resident. I’m dining tonight with Lanza, his web and brand manager Mike Ford and John Ford, Mike’s father and a good friend of Lanza’s. We meet at the bar and grab a beer — Ithaca Flower Power, Louie’s choice, before he leads my party to our booth near the stage. Though empty on my visit save for a single red piano handcrafted by the elder Ford, owner of the neighboring Ford Piano, that stage hosts live music every weekend and is capable of holding an 18-piece band. “We want to give people a New York City experience without the attitude,” Lanza says. Opened in 2014 and recently named one of the top restaurants in the country by OpenTable, The Hudson Room was Lanza’s first foray into restaurant ownership in Peekskill. Prior to that, he ran a dozen restaurants in New York City over a 25-year span. He took the money he earned from selling his Manhattan holdings and bought a number of buildings in Peekskill. 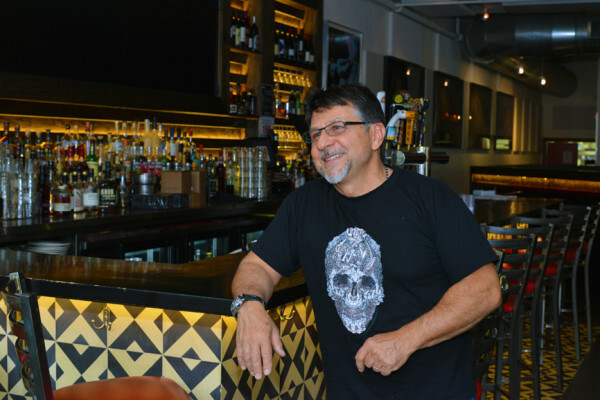 He also owns Taco Dive Bar at 55 Hudson Ave., a taco and tequila venue sporting views of the Hudson River, and has two restaurants set to open in the coming months — Eagle Saloon, which will sit next to The Hudson Room, and a Buns-N-Bourbon place next to Taco Dive Bar. Lanza is also working on converting a 14,000-square-foot space along the Hudson into an event-catering venue, restaurant, brewery, distillery and amusement center called The Factoria at Charles Point. “He’s got two speeds — fast and faster,” John says of Lanza. Our dinner starts with what can only be described as an array of appetizers. Creamy guacamole sits on a baked flour tortilla crisp and a succulent piece of shrimp topped with sweet mango salsa and Sriracha sauce. Steamed edamame is tossed with spicy seasonings. Nachos are smothered with white beans, asiago cheese and tender smoked pork. And butter — glazed dumplings, my personal favorite, are stuffed with creamy butternut squash and a bacon garnish. Lanza set the entire menu himself, spending 15 months in the kitchen prior to the restaurant’s opening to make sure everything was just right — and it shows. He also puts an emphasis on local ingredients. Some of those ingredients, like the goat cheese topping our nachos, are even sourced from his 40-acre farm in Garrison. 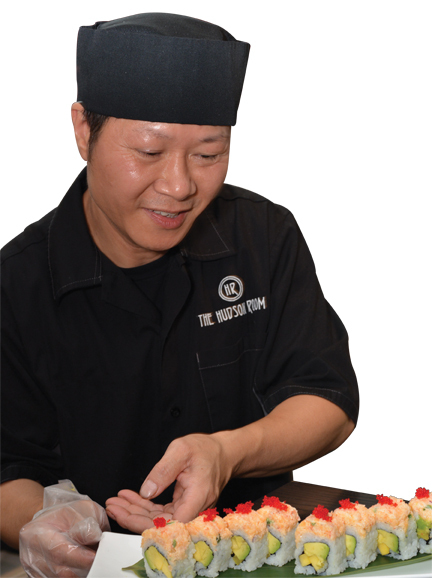 At Lanza’s suggestion, I opt for the Ying & Yang Roll, one of The Hudson Room’s most popular dishes, and for good reason. The shrimp and avocado roll is topped with pan-seared filet mignon that nearly melts in your mouth. It only takes a few tries for me to realize, along with some urging from Louie, that it’s time to ditch the chopsticks and decorum, to use my fingers. The dish is just that good. Mike shares his choice, a shrimp and lobster salad roll with avocado and a mango-yuzu sauce, with me. I also sample bites of salmon, yellowtail and tuna sashimi dipped in soy sauce. Between bites, Lanza talks excitedly about what drew him to the city. “It’s the sixth borough,” he says, adding that Peekskill has both the mom-and-pop storefronts and the big-city grit other Westchester communities lack. “You don’t want it to become American white bread,” he says. Despite multiple protests of being too full to even think about a dessert, Lanza insists our table indulge in an after-meal sweet treat. Besides, who can say no to ice cream? We’re served a stemmed glass filled above the brim with espresso caramel crunch and walnut vanilla custard with maple marshmallows, each of us digging our spoons into the decadent and delicious ending to the evening. As our meal comes to a close, we discuss Lanza’s vision for the future for Peekskill. 1. Place all ingredients in a bowl except for the olive oil. 2. Blend with an electric hand blender and slowly drizzle in the olive oil. 3. Season with sea salt and pepper. 1. Place all salad ingredients except sunflower seeds together in a large mixing bowl. 2. Add the vinaigrette, mixing well with tongs. 3. Divide into four to six plates. 4. 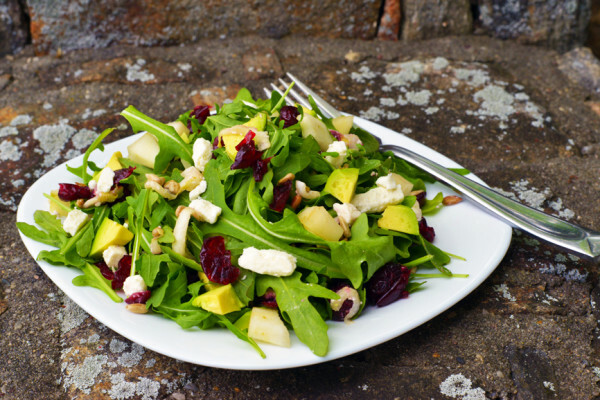 Sprinkle the sunflower seeds over the salad just before serving.